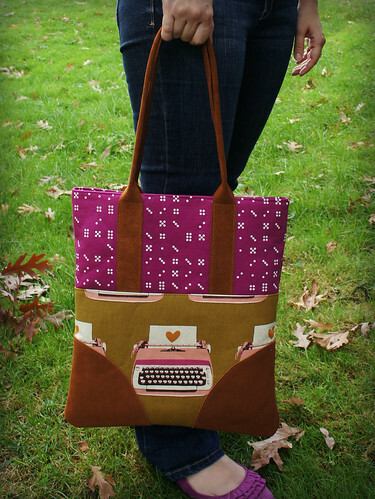 One of the projects that I started at Sewing Summit but wasn’t able to finish as I mentioned before was Lindsey’s Tote Bag with Leather Accents. I took both her classes there, a very informative lecture on sewing with leather and an actual sewing class. The sewing class, if you will recall, was at the end of all of the classes and I was wiped out. So instead of pushing through and making a sloppy bag, I took all of my cut, interfaced pieces home and sewed the bag together with leisure. I need more time when sewing bags…heck probably more time with everything. I’m not a speed sewer. I love the fabrics I picked out for this bag. The typewriters are an epic print by Melody Miller (good luck finding any! they are out of print), the fuchsia print is called Domino Dot by Violet Craft and is just released, and the interior is an older Little Lisette print by Liesel Gibson for Joanns (you can find it still in other colorways). And then there is the leather… yum. I added a couple of simple extra pockets to the interior, but opted not to include the magnetic snap closure because those don’t really work well for me. They seem overly strong. 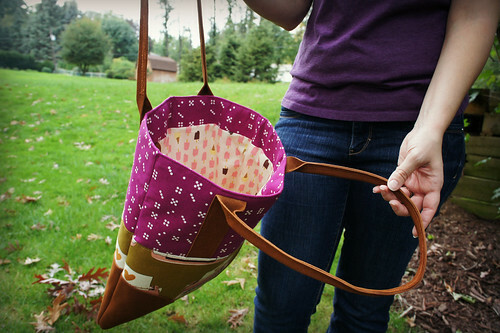 The bag itself is a fairly simple sew, once you figure out the mechanics of sewing those leather parts. I personally split my sewing time into bag prep, leather sewing, and then final bag construction. Like I said, I’m not a fast sewer and I was a bit nervous about tackling this new unknown, leather. But let me tell you…I am SOLD. Leather accents add such a quality professional touch to a bag. And Lindsey is making it super easy for those of us who don’t want to brave our local tannery to get some fabulous leather. She’s opened a shop to sell leather kits (or I’m sure whatever you need) and there are great colors (even metallic!! must get that!). 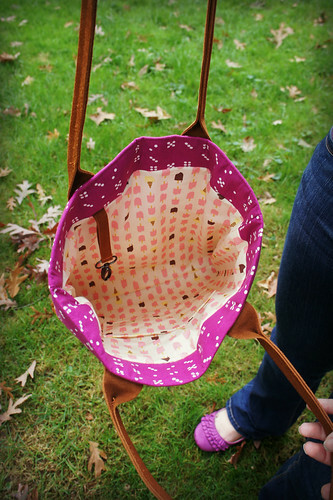 Oh and she also has the pattern for this particular tote for sale as well (or you can find it on craftsy). I love when something unique like this hits my little world of quilting cottons and my eyes are opened. I feel like I have a whole new option of patterns and designs available now with this new technique. Wow! Your bag looks fabulous!! I love the bag you made! The typewriter and leather accents are wonderful. It has turned out beautifully…and I do think I recall seeing you with a bundle of the Alison Glass prints in your hands!! Perfect match for the typewriter. I love this! You're right, those leather bits really add a lot. I also love how it matches your shoes! Your photos are always so well thought out. Great work! You did a great job with this from the fabric selections to the construction. It's lovely. Love. this. bag. Looks super sharp. P.S. I got typewriters to last me a while. It's the Domino Dots I don't have, and I want them, waaaaah. That s a stunning tote!! Ummm, how WOW is this??!! YAY! And with those shoes??? Perfection. 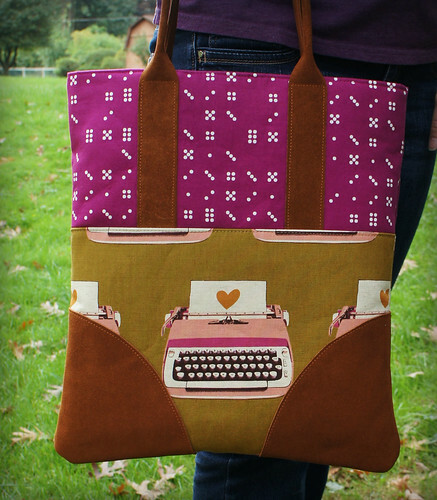 your bag finished up beautifully and I just love your fabric choices. So pretty! That sounds like a useful class for sure. Do you think you'll be teaching again next year? This bag looks fantastic, Angela — great prints and I love the leather accents. I will definitely have to check out that shop! Absolutely beautiful!! I'm pinning it!! I need to have one of my own :). 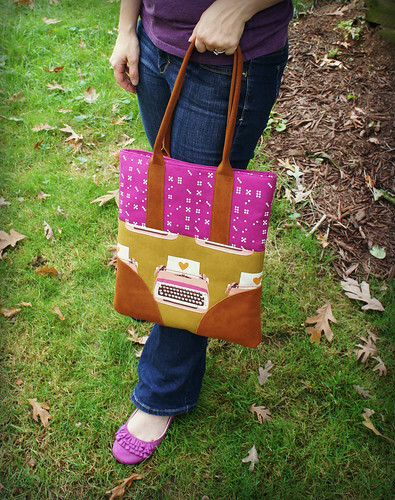 Great use for the typewriter fabric I've been hoarding. Love how this turned out, I bet you'll be making loads of people jealous when you take it out!